Pocket Stones™ are the original and most popular of Inspiration Stone, Inc.'s products. 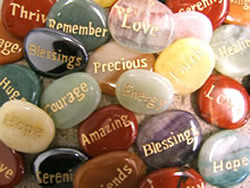 Deeply engraved with inspirational and motivational words, these ancient, finely etched, semi-precious stones make ideal gifts, keepsakes and collectibles. Great inspirational messages on life. They seem to touch the hearts of all who receive them.